Reiki - what is it and how does it work? You might have heard the term ‘energy healing’ and wondered: what is it all about and how does it work? At least those were the questions that I asked when I heard the first time about it. Energy healing has become quite popular nowadays and maybe you even know a few people that have tried it already. The first time I learned about it in detail, it took me a while to understand what it is and what it can do. I had a lot of questions and I want to share the answers to a few questions in this post with you to let you learn more about Reiki. I thought it is best to get these questions answered by a Reiki Master herself, so I asked my friend Ann-Sophie from in balance to respond to a couple of questions I picked. Reiki is a part of alternative medicine, also known as energy healing. It originates from Japan around 1930. ‘Rei’ means universal and ‘ki’ means energy. The practitioner channels universal life force energy and applies it to the client’s body while placing the hands in different hand positions from head to toes. The hands can be touching the body or be above in the air. 1.) mental level: the client feels relieved of stress and relaxed. 2.) physical level: as a matter of fact, it can work pain-relieving. 3.) emotional level: emotions, which we have stored in our body, might come up and can finally be released. Where does the energy come from in a Reiki treatment? The reiki practitioner channels the energy from the universe and applies it through the hands on the client’s body. You could also call it the higher source or the divine. It is the energy we are surrounded by all the time and everywhere we are. Albert Einstein was the one who found out in his quantum physics research, that energy can be applied from one system towards another. It’s important to understand, that the practitioner doesn’t use his or her own energy. Therefore Reiki is never tiring, it’s actually the opposite. What do you feel when you are treating someone? I have many different sensations, starting from different temperature perceptions, tingling in my fingers and then of course different kinds of intuitive awareness. I’m observing the clients reactions in response to the Reiki energy as well. I never think, I am in a deep meditative state of mind and follow my intuition. I work with the chakra system and can notice where energy is needed, where there is too much energy and if energy is stuck somewhere or blocked through all the different sensations I have and the intuitions or insights I receive. What does the person feel you are doing the treatment with? The client feels very calm after a few minutes, the breathing becomes more evenly, so that he or she can experience relaxation in the deepest areas of the body. That is the state where the self healing powers of the body get activated naturally. Sensations during treatment include: relaxation, heat and cold perception, tingling, slight twitching of muscles, seeing colors or images. Can anyone learn how to do it? Yes, definitely! The ability to channel Reiki energy is in everyone of us and can be activated through a Reiki initiation by a Reiki Master while doing a Reiki level I course. There are three levels in total. First it’s all about giving yourself Reiki treatments which is recommended to do daily. If everyone is suitable to give Reiki treatments to people, including to deal with different reactions and giving suitable advice to clients, is a different question. A lot of sensitivity, empathic capacity, clarity and mental strength is needed. Does Reiki have to be practiced in a certain environment or space? Reiki is a sacred practise and it makes sense to practise it in a safe space, where the client can relax and let go of emotions. The space needs to be cleansed energetically before the session to make sure there is no negative energy around. 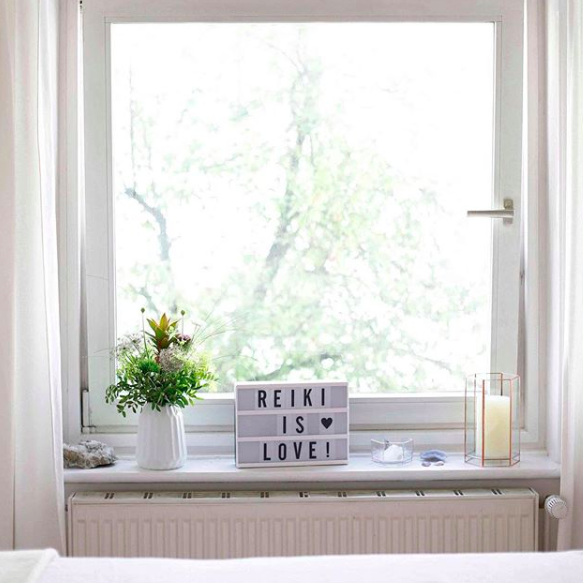 It is really nice to have one specific room, where Reiki is practised often, because then there is a lot of good energy captured. The client will feel at ease quickly and it is easier for the practitioner to connect with the Reiki energy and not to get distracted during the session. If such a space is not accessible, but someone needs Reiki, I always make an exception and simply look for a quiet place I can cleanse energetically before the treatment with incense. Can Reiki help to heal physically? That question is a bit tricky, because the thing is that there is no guarantee at all, because Reiki works differently for different people. There are so many factors influencing the healing process of a client and everyone is so different. Also: everyone can only heal themselves. Receiving Reiki is also about wanting to understand the own body and health and about taking responsibility for it. I can only tell from my own experience and can definitely tell, that some of the treatments I gave to clients were helpful and physical pain disappeared afterwards. Why did you choose to become a Reiki master? My inspiration to start learning Reiki was my mom. She has Reiki level II and is basically the most amazing person I know on this planet. She gave me Reiki when I was a teenager, but at that age I could barely understand what it is about and I was very sceptical as well. Since I tried it out myself and did Reiki level I, it influenced my whole life in such a positive way and on so many levels. I see the world with different eyes now and have the ability to grow so much, not only spiritually. I always wanted to help other people, but I didn’t really know by doing what. Then after finishing the Reiki level II in Cambodia, I realised that this is what I need to be doing: I want to give Reiki treatments to others to help them to heal themselves. How did Reiki impact your everyday life? It is amazing how my life has changed through Reiki: my perception of body and mind has risen multiple times. Through Reiki I have the opportunity to treat myself preventively or when I am sick - anytime, anywhere. My sensitivity is rising constantly and I communicate on different levels with my surrounding. I learn so much from treating others, everytime the client is mirroring me a topic I am dealing with it as well. It’s about being a teacher and a student at the same time and I am so grateful for all the experiences I made so far. Watch this video by Ann-Sophie where she explains Reiki in detail (with English subtitles) and visit her on her website inbalance-healing.com. She is based in Hamburg, Germany and has a practice there for Reiki. If you are overseas, she is also doing Distance Reiki - for any questions, just send her a message.